Tyrone and Lesley and The Pockets are the final headline acts to be confirmed for SPRUKE Brisbane’s Ukulele Festival 2017. 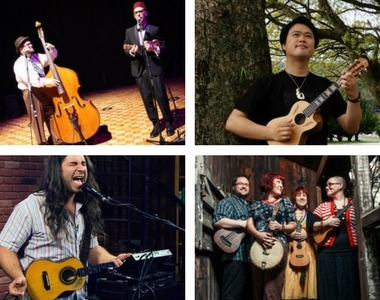 These homegrown artists join international acts ukulele virtuoso Kyas Ryo from Japan and the Alaskan wild man Ukulele Russ. All the headline acts will perform at the opening concert ‘Spruketacular’ on the Kala Concert Stage Friday night and continue to inspire and educate festival goers at workshops and master classes over the weekend. This year’s Spruketacular line-up has something for every music lover from quirky, theatrical songs of Tyrone and Lesley, the style and technique of Kyas Ryo, the stunning harmonies of The Pockets, and the laugh out loud musical antics of Ukulele Russ. The Morris Brothers Festival Finale concert on Sunday afternoon will showcase local bands and festival goers can jam with the international acts. Regular Sprukesters know that this is a not to be missed experience- anything can and does happen! Stay tuned tickets for the concerts will be available soon.